If you love the idea of taking up horseback riding but you're wondering if you're too old to ride, the short answer is no. Horseback riding is something that can be enjoyed at all levels, in a wide variety of ways, long into one's golden years. That said, if you start riding later in life—say in your mid-forties—without any real prior training, you are going to have your work cut out for you getting into shape. Horseback riding builds and tones large muscle groups, and is great for cardio; but contrary to popular myth, the horse is not doing all the work—you are. If you come into the sport already in good shape from playing a variety of sports or are currently physically active, the fact that you're already fit will help you tremendously. However, even if you are fit, riding is a sport that requires the use of muscles that other sports may not require. But, don't give up—a trainer will teach how you to ride the correct way, reducing the risk of injury to muscles and joints. Another important consideration is that you will fall off the horse—that's a given. Whether you ride in lessons with a trainer, or on your own for an extended period of time on a regular basis, you will eventually fall or fly off the horse. It doesn't matter if you are on the safest horse, in the most controlled environment, and have been riding for years, at some point you'll be thrown to the ground. Horses are finicky and easily spooked and the truth is, they just don't want you on their back. And, when you are 45 years of age you don't bounce back like you did when you were ten years old. As we age, our reflexes slow down and we are not as supple. However, you can reduce the risk of serious riding injuries (to you and your horse) by working with an experienced trainer and always wearing a safety helmet. Horses are animals, not machines. You can't pop in a quarter and expect that every time you ride them they'll do exactly what you want them to. This is a hard concept for a lot of people to comprehend. Although a skilled trainer can influence a horse to do what they want better than an amateur who rides only occasionally, even trainers sometimes fall or are bucked off their horses. Any horse, just like you and me, will have good days and bad days. Horses, just like people, can get stiff and sore. They can become tired and frustrated with people learning to ride on them. And, just like people, horses have different personalities. Some horses have very little tolerance for inexperienced riders, while others are more forgiving of their riders' mistakes. Ask any trainer; a great school horse that is gentle and patient is hard to find. 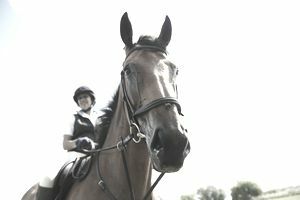 However, a truly good trainer will try to pair you with a horse that is suitable for your skill level. How Much Time Should I Devote To Riding? The ability to practice frequently is a huge factor in how fast you will progress in any sport. If you can ride at least several times a week you will advance quickly in your riding skills. If you can only manage one or two lessons a week that is fine, but you might not progress as quickly as you would like. Riding takes a lot of time, patience, and practice. This is where a professional trainer comes in because a good trainer can help you get the most out of each ride—no matter how often you take lessons. Why do you want to ride? Do you want to show (i.e., compete)? Do you want to casually learn at your own speed without rushing? Do you want to learn to jump, or does learning dressage movements or reining maneuvers excite you more? Is this going to be more of a casual passtime, and if not, how many days and hours a week can you commit to riding? Would you rather trail ride at a rental barn or take lessons at a training barn? Is your ultimate goal to have your own horse, and possibly ride professionally as a way to earn a living? These are important things to communicate with your trainer because your reasons will be unique. Based on your answers, a trainer can help you set reasonable goals and expectations. Horseback riding is a time-consuming and expensive sport. But, if you don't mind the risk of taking a tumble now and then, want a fun way to shed a few pounds and get into shape, and you love the sound of whinnies from a magnificent four-legged creature, then taking up riding may be just what you need. Farms and riding stables can be found practically everywhere, even in many big cities. Riding is not just a sport to get your body fit; there are treadmills for that. Riding is a great way to get out of this fast-paced, cement-covered, cell-phone-service world, even if it is for just an hour or so. Another bonus is that spending time with horses helps reduce stress.